Communicating Between Lenses is a dialogue that takes place on two sides of a lens. 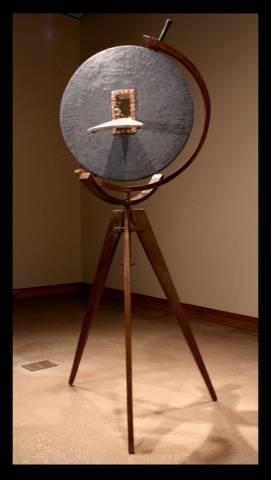 This sculpture magnifies the opposing emotions created by long distance video communication. The bundle of hair that spans each side of the large lens creates a tangible and personal connection between the parties, but the lenses that it links corrupt the view to the other side emphasizing the intermediary device that is enabling the conversation. Wood, Steel, Graphite, Concrete, Bee’s wax, Hair, Thread, Lenses.